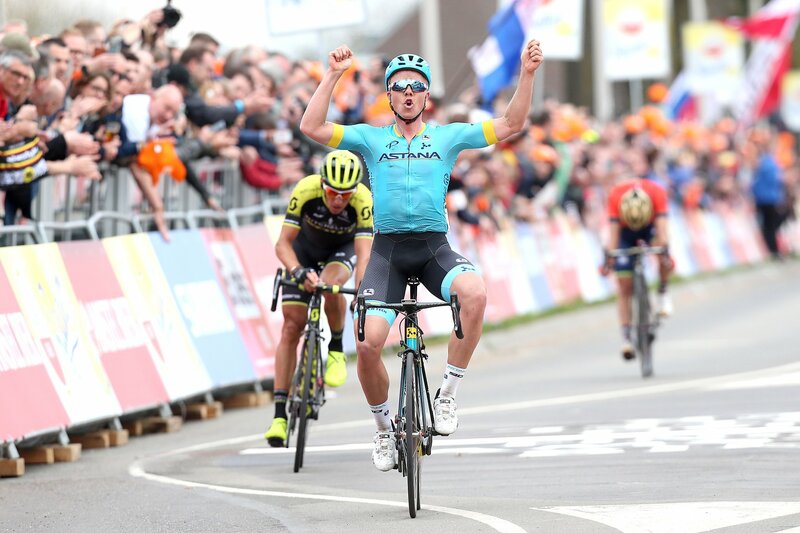 Michael Valgren (Astana) took the honors in the first Ardennes Classic of the season, after claiming today’s Amstel Gold Race in Valkenburg, Netherlands. The Danish rider managed to escape late in the race from a lead group of eight riders, which included pre-race favorites such as the world champion Peter Sagan and Alejandro Valverde. Valgren made his move with just over two kilometers to go in today’s 263 kilometer race, but the Astana rider was soon joined by Roman Kreuziger (Mitchelton-Scott) who managed to bridge his way to the lone leader during the final 1500 meters. 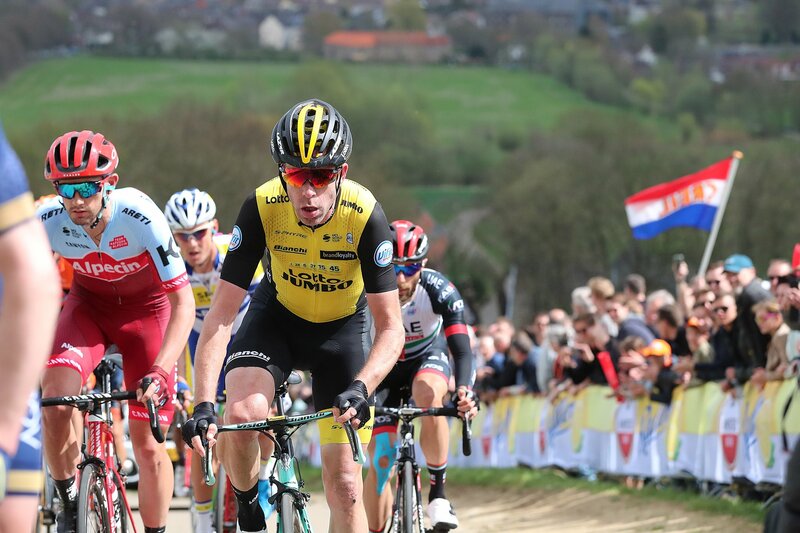 However, Valgren was successful in dispatching Kreuziger, after opening up his sprint during the closing few hundred meters, leaving his Czech rival unable to respond. 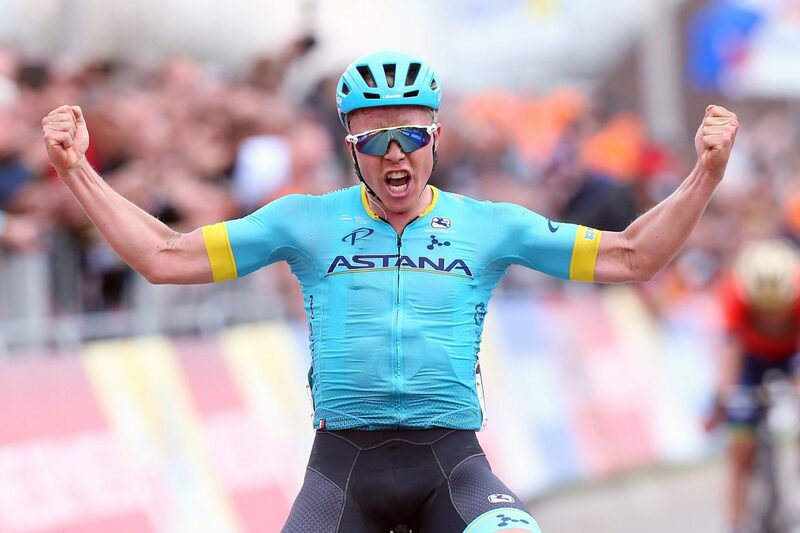 Today’s win marked Valgren’s second title in this year’s Spring Classics calendar, after he took victory in February’s Omloop Het Nieuwsblad. Meanwhile, Bahrain-Merida’s Enrico Gasparotto rounded out podium in third place. A small breakaway group containing Bram Tankink (LottoNL-Jumbo), Tsgabu Grmay (Trek-Segafredo), Matteo Bono (UAE Team Emirates), Lawson Craddock (EF-Drapac), Oscar Riesebeek (Roompot), Eddie Dunbar (Aqua Blue Sport), Marco Tizza (Nippo-Vini Fantini), Willem Smit (Katusha-Alpecin) and Preben Van Hecke (Sport Vlaanderen-Baloise), managed to escape early on in today’s race. From there, the peloton was content in allowing them to establish a massive advantage of more than 15 minutes. However, the repeated climbs of the Ardennes race eventually reduced the breakaway’s lead to just 3 minutes with 50 kilometers still to go. Attrition continued to take its toll on the leaders, particularly after the climb of the Eyserbosweg, which saw their margin drop to just 1:40. Meanwhile, back in the peloton, there were numerous efforts to bridge to the lead group. For instance, Greg Van Avermaet (BMC) and Rudy Molard (FDJ) were able to briefly ride clear of the main field with 15 kilometers to go, But, the duo soon found themselves in purgatory as they were unable to make the junction to the front group who were still clinging to a 20 second lead. The breakaway group was eventually neutralized over the top of the Geulhemmerberg, with Valverde dragging a group of riders with him such as Tim Wellens, Peter Sagan, Michael Valgren, Jacob Fuglsang and Julian Alaphilippe, after commencing a stinging attack just before the summit. Unfortunately for Van Avermaet, Philippe Gilbert (Quick-Step) and Michal Kwiatkowski (Sky), they missed out on the move, and were quickly dropped into a group of riders that found themselves over 20 seconds adrift of the leaders. Fuglsang was the first to try his luck along the final climb of Bemmelerberg, but the Swiss rider was soon joined by Valverde and the rest of the group. Astana then tried to make their two-man advantage count as Valgren attacked with 4.6 kilometers to go, but his aggressions were closely marked by the group who seemed determined to prevent anyone from getting clear. However, with just over 2 kilometers remaining, Valgren initiated a subsequent attack, this time taking advantage of the hesitation in the group, as Sagan and Valverde were likely expecting a sprint finish to decide the race. Nevertheless, Kreuziger was keen to respond, quickly making his way to the Dane. In the meantime, no-one appeared to be interested in trying to reel the two leaders back in. This prompted Gasparotto to execute a late attempt to bridge his way to the pair, but to no avail.